In 2013, John's wife passed away. He met her when they were both residents in a homeless shelter and they both turned their lives around and found Jesus together. The passing of his wife left him hopeless and now he finds himself experiencing hopelessness again. 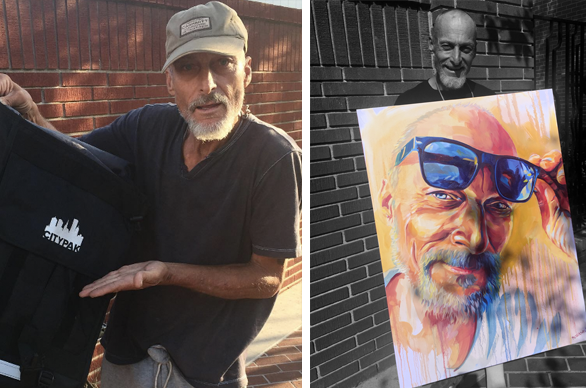 John regularly displays generosity towards all his neighbors and spends much of his time, talents, and treasure helping others however he can. He spent the last few years alongside his buddy James who has continually become ill. After a visit to the hospital for a bacterial infection, his friend James was discharged and we haven't seen him since. John longs for the day he will see James again. John now attends church with me every Sunday and I have seen a lasting change in his heart. When he first viewed his painting, he was shocked by how alive the piece portrayed him. "This is how my sister must see me", he explained. John is now finally starting to see how much life he still has left within himself.